Have a 1960 New Yorker 413. When I got it, it had a near new 2" twin exhaust with and has a pair of 16" straight through glass pack mufflers. Its surprisingly very quiet but drones at cruise really badly. Any opinions on how to get rid of the drone? I dont want to go quieter as you can barely hear it now and Id like it to have a decent rumble but without the drone. In fact Id be happy to go a bit louder out back if thats what it takes but want to get rid of the drone either way. Ive been told adding an H pipe might help? Or maybe removing the mufflers and replacing with resonators? Location: Chestertown, NY ( near Lake George) Anything you do is kinda experimental. Some exhaust extensions can also cause this. Location: So. California Glasspacks in oval containers do drone more - at least all the ones that I have tried. If you replace them with turbo style mufflers, that would help. Also, it is best to get them as long as possible. 16 inches isn't very long, but it looks like you may have to do some re-routing to fit longer ones in there now. For that reason, I don't like to angle the mufflers like that. Also, I don't really understand the benefit of putting the exhaust right next to the driveshaft. Location: Sydney Would you consider adding a hot dog or resonator further upstream of any benefit? The local shop reckons an H pipe but I have my doubts. Location: So. California Anything extra will help, but you will be increasing the back pressure too. I have tried H-pipes and it didn't change things very much. Not worth the trouble in the end. 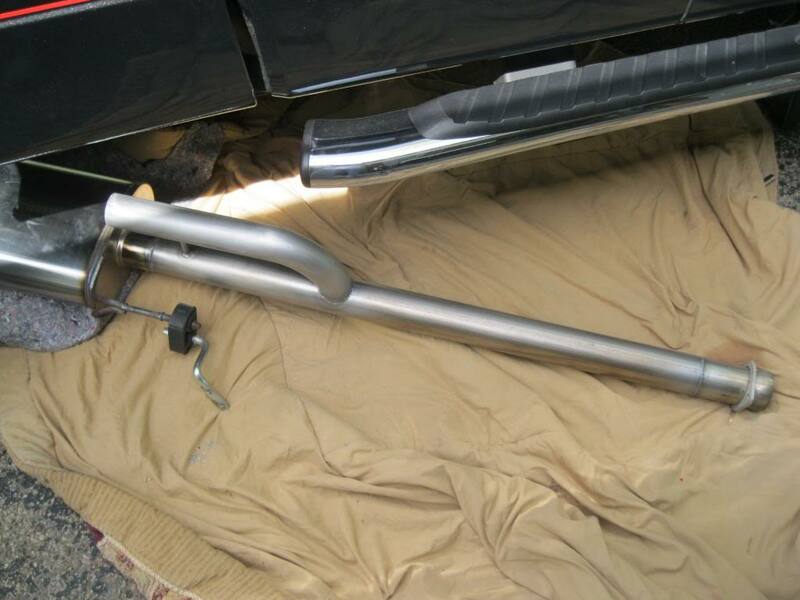 Location: NorCal I'd try to fit a resonator in the tailpipe if there's room, size will depend on your pipe diameter. Location: Southern Sweden - Sturkö island Take a photo on your end pipes - you have what looks like the very same system that I have on my '60 Saratoga and I have no drone in any conditions. Is the butterfly valve frozen partly shut? Location: northern germany What Chizler said, tailpipes. I'd try to fit a resonator in the tailpipe if there's room, size will depend on your pipe diameter. Does the resonator have to be in the tailpipe? Dont think I have room there but I would have in the engine pipe before the mufflers. 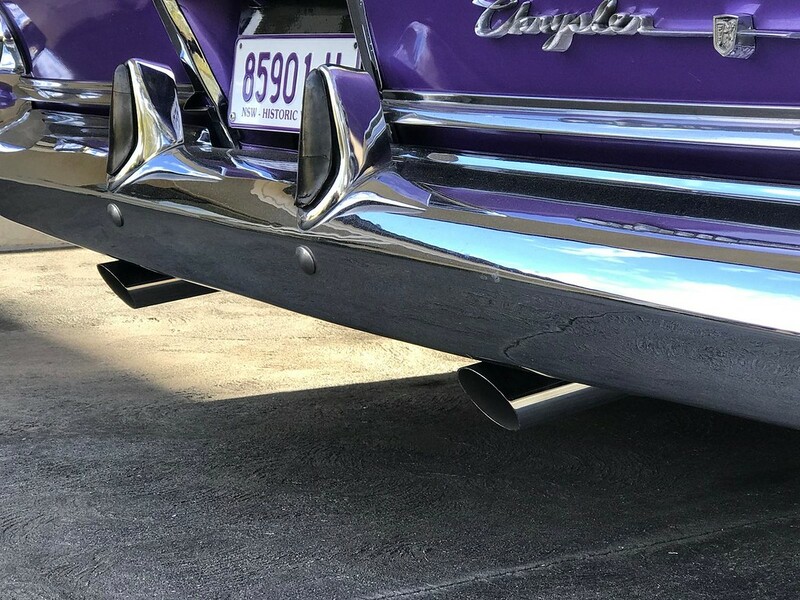 Take a photo on your end pipes - you have what looks like the very same system that I have on my '60 Saratoga and I have no drone in any conditions. If thats the assembly that used to be part of the cast iron manifold, it appears to have been removed decades ago. 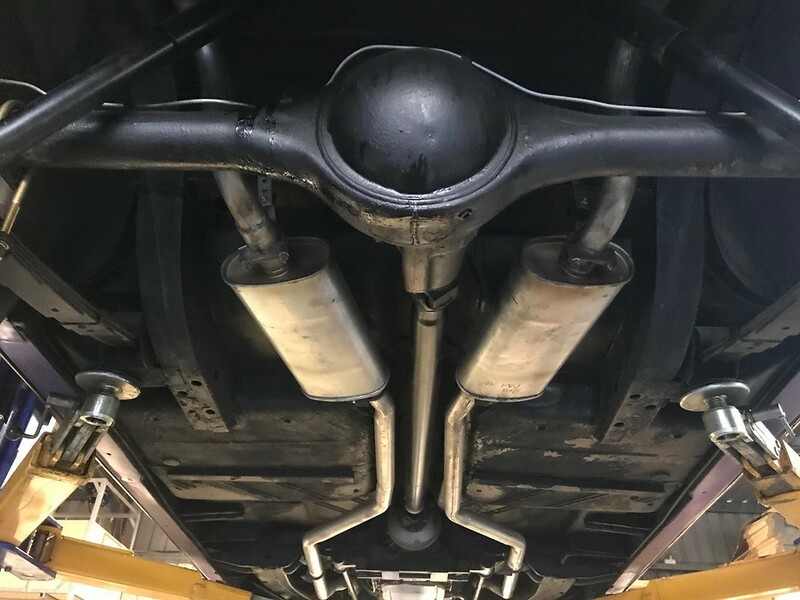 Location: Stockholm Sweden I´ve got the H pipe 1.8", exhaust pipe 2.5", oval mufflers 20" long and at the interval between 40-50 mph the car (New Yorker 61) drones. Quite a loud and impacting sound. I´m also looking for some solution to this. Location: Southern Sweden - Sturkö island Ok, it seems like that the both of you have the very same exhaust systems as I have. The butterfly valve is indeed the valve in the right exhaust mainfold - if it's removed it means that it cannot cause this type of probems. The Saratogas and New Yorkers should have a front muffler as well (and Imperials) - I don't have these front mufflers and no drone at all. Location: Netherlands Installing a dead-ended piece of extra pipe, T-connected to one tube of the exhaust can help greatly reducing drone-noise. Length of the added tubing is important and needs to be tuned/calculated to the exhaust. Location: Netherlands I had doubts what it was called again in my previous but remembered this setup is usually called an exhaust helmholtz resonator. Look it up with Google Images to get the idea. Location: Southern Sweden - Sturkö island Ok, Helmholtz resonator - thanks' for the correct name Herman. Practically it works like a pulsation damper (usually installed in water pipe systems). Location: Southern Sweden - Sturkö island Marc, I saw in your other photos that your car has straight end pipes coming out under the rear bumper - on the phot above you have the "correct" end pipes. Which version has the droning sound? Marc, I saw in your other photos that your car has straight end pipes coming out under the rear bumper - on the phot above you have the "correct" end pipes. Although Im driving it a lot more more! Could that little bit on the end be responsible for the drone? Location: Southern Sweden - Sturkö island I really don't know Marc, but judging by your photos we have the very same exhaust system and the engine difference is only 30 cui. Just demount the extensions and check which result you'll get. I had doubts what it was called again in my previous but remembered this setup is usually called an exhaust helmholtz resonator. after an accurately tuned in engine. to the trunk and the gas tank? Yet another thought, have I got too large a volume in the 2.5" exhaust pipes? Location: Netherlands I don't think for one minute the end of a full exhaust-system has any effect on causing drone or not. 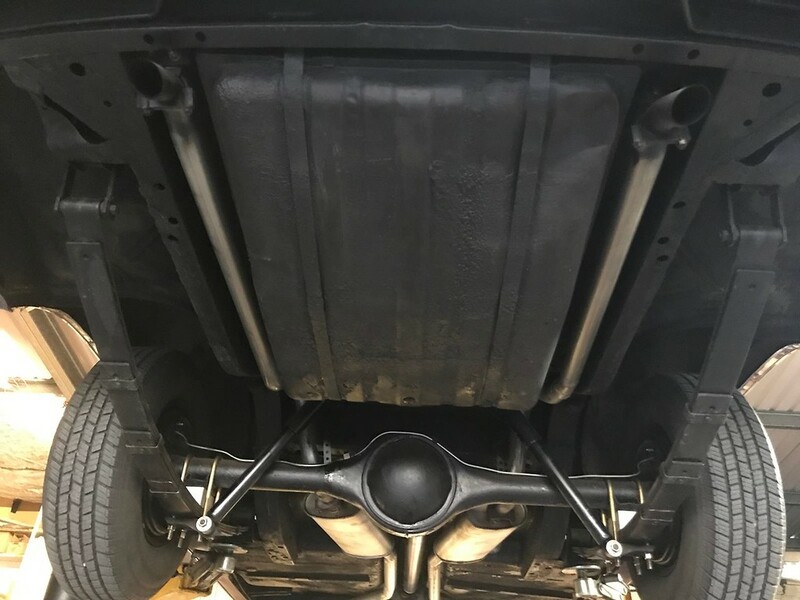 Droning is a combination of either both mufflers producing the same noises which are amplified, and/or cause floorboard-sheetmetal to resonate along with the muffler noise. I also think the type of exhaust hanger could be a good candidate for causing interior noise/drone. Is the exhaust hung on the frame rails (near the mufflers), or, for instance the bolts of the rear seatbelt brackets? How much rubber is used between the hanger and the mount on the car? Also lack of proper (heavy/tarmac) sound-deadening could 'help' the drone-noise carry itself further into the cabin. I don't think for one minute the end of a full exhaust-system has any effect on causing drone or not. But i do. At least in my car, it has. and as a obvious step should be to dampening the interior of the trunk floor, wheel houses and against the back seat might do a difference. Location: Netherlands Besides droning issues, sound-deadening itself is usually a multi-stage process. Low/heavy noises require heavy material (butyl) to suppress. Higher pitched noises like road/tire/wind-noise require a lighter material like foam to dampen properly or best. You can see how (60-70's) luxury cars like Chryslers and Imperials where build in the day. They had heavy butyl-plates put directly on the floorboards, and 1" thick foam-insulated carpetting on top of that for added 'silence' and driving comfort. Location: Sydney I wish I had some of that padding in mine! The droning has improved with more use.